Freddie Burns kicked 18 points against his former club as Leicester ended Gloucester's unbeaten start to 2015. Burns and James Hook slotted three penalties each in the first half, while Mark Atkinson's try for Gloucester was disallowed as the teams went in at 9-9. 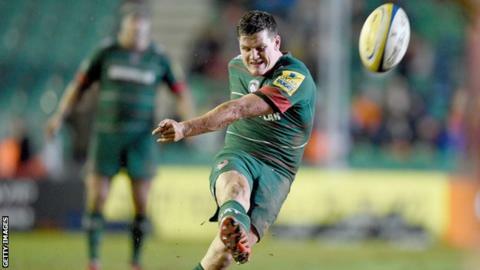 Two penalties in the space of 60 seconds saw Leicester move 15-9 ahead before Hook scored two of his own. Gloucester's Charlie Sharples saw yellow late on and Burns made it six penalties out of six to seal the win. Richard Cockerill's Tigers, who went into the match on the back of two victories in the LV= Cup against Northampton and Cardiff Blues, move up to fourth in the Premiership table, while the Cherry and Whites remain in ninth. With blustery showers sweeping across Welford Road from the start, the conditions played a part in the hosts' first points of the game as Darren Dawidiuk's wayward line-out throw led to a scrum followed by a penalty, which Burns coolly landed against the side he left at the end of the 2013-14 season. After Wales international Hook and Burns exchanged further penalties, the Gloucester fly-half was not disrupted by the swirling wind as he slotted home another from the halfway line. The visiting pack then began to dominate the play as an infringement in the scrum led to another perfectly-executed Hook penalty, before Gloucester missed an excellent opportunity to cross the whitewash for the first time. Burns was caught out trying to run the ball by Dan Robson, it was switched across the line but the final pass from Henry Purdy to Atkinson was adjudged to have gone forward. Five minutes before half-time, Burns converted his third penalty as Tigers pushed forward, but the half ended all-square. After the break, ill-discipline from Gloucester cost them two penalties within a minute as Burns continued his fine kicking from the tee - including some help from the post for the second - before Hook reduced the deficit with another penalty to make it 15-12. Tigers were beginning to dominate, but the visiting defence held firm with relentless tackling and were eventually given some respite when Sebastian De Chaves was caught offside and Hook sent the resulting kick over to make it a level game again. With just over 10 minutes to go, Gloucester wing Sharples was sent to the sin-bin for an infringement at the breakdown and Burns kicked the penalty for the final score of the match. There was still time for Hook to miss a long-range attempt at a late leveller, as Leicester held on for a hard-fought victory. "Freddie came to see me a few weeks ago about selection and I said that while he was kicking at 60%, and Owen Williams was kicking at 80%, Owen would play because that's the difference in games and we saw that tonight. "If he had kicked at 60% we would have lost. He brought in Paul Grayson to work with him. I encouraged it but sometimes players have to work it out for themselves. "Freddie is a bright lad and he works hard. We saw the benefit of that tonight. "He's a Test player but he has to be consistent and do it next week and the week after, and that will get him to where he wants to be. I'm delighted for him." "I'm not sure whether we deserved a draw but I'm disappointed to come away with a loss. "Credit to Leicester but we had a few opportunities in the first half, and you have to take those if you want to win at Welford Road. "That disallowed try was a real clear cut opportunity, and against the top teams you have to take opportunities like that." Leicester Tigers: Tait; Thompstone, Catchpole, Bai, Goneva; F. Burns, Harrison; Ayerza, Briggs, Mulipola, De Chaves, Kitchener, Gibson, Salvi, Crane (capt). Replacements: Thacker, Rizzo, Balmain, Whetton, Pearce, Mele, Roberts, Benjamin. Gloucester: B. Burns; Sharples, Atkinson, Meakes, Purdy; Hook, Robson; Murphy, Dawidiuk, Afoa, Savage (capt), Palmer, Kalamafoni, Kvesic, Evans. Replacements: Lutui, Thomas, Knight, Hudson, Moriarty, Braley, Trinder, Reynolds.